We all heard about the importance of fiber. Fiber prevents colon cancer and lowers LDL cholesterol in the blood, which prevents heart attacks. But what is the evidence that fiber really is beneficial to our health? The following publication is reviewing what health benefits fiber has for us. First of all what is the recommended amount of fiber intake per day? For men it is 38 grams of fiber per day, for women 25 grams per day. Fiber is necessary for the digestion of food. It fills the bowel and stimulates peristalsis. It prevents irritable bowel syndrome and inflammatory bowel disease like ulcerative colitis. Insoluble fiber speeds the passage of food through the digestive tract. Insoluble fiber consists of wheat bran, vegetables, and whole grains. Soluble fiber is contained in bran, nuts, seeds-such as flax seed- and beans. It turns into a gel when water is added, which provides bulk. A study from Boston’s Harvard University showed that when men consumed 28.9 grams of fiber per day they had 40% less risk of developing heart disease. It is known that fiber lowers the bad cholesterol, LDL cholesterol. Eating fiber-rich vegetables, fruit and beans helps to give you a feeling of fullness as you eat. You are likely more satisfied and stop eating earlier than if you consume food with lower fiber content. Research showed that for every10-gram per day increase of fiber over 5 years belly fat was reduced by 4%. A control group that did not change the fiber content did not show these results. Fiber also helps to prevent diabetes. Fiber is indigestible, and it binds sugars to itself so that sugar absorption is much slower. Post-meal spikes of blood sugars are less prominent. This means there is less insulin release from the pancreas when you eat a meal with lots of fiber. In one clinical trial diabetic patients, who ate 50 grams of fiber per day, had a much tighter blood sugar control that those who ate less fiber. In the past it appeared that fiber was protecting people from colorectal cancer. However several studies have shown that fiber does not seem to be the factor that suppresses colorectal cancer. It may be the carotenoids in the vegetables rather than fiber that cause lower rates of colorectal cancer. Newer research shows that the colon cancer protective effect likely is not due to the fiber content of food. Instead it is due to carotenoids in the vegetables. Knowing this, you should incorporate enough vegetables in your diet. However, fiber in our food does have significant effects on lowering blood sugar and preventing diabetes. Fiber lowers LDL cholesterol and thereby prevents heart attacks and strokes. It improves digestion and bowel movements and prevents constipation. Weight loss is also one of the effects of increased fiber intake. Processed foods often lack fibre. 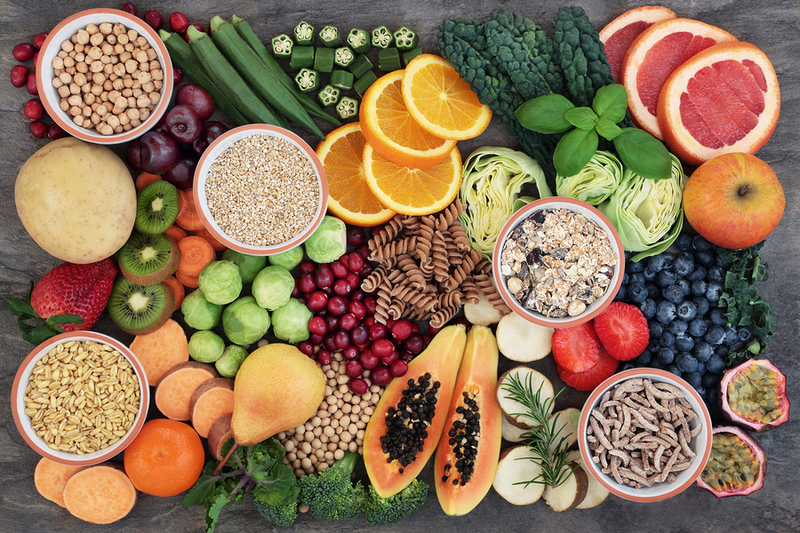 By sticking to basic, whole and unprocessed foods, such as vegetables, nuts, seeds, beans and fruit we increase our fiber intake and will achieve better health.